No More Damp tanking slurry is a cementitious waterproof system that when mixed with clean water and applied correctly will form a permanent waterproof coating to concrete and masonry. Easily applied by brush or roller. Used for waterproofing of basements, cellars , foundations , swimming pools , concrete , renders , brickwork and blockwork. Can be used Internal & External , above and below ground. 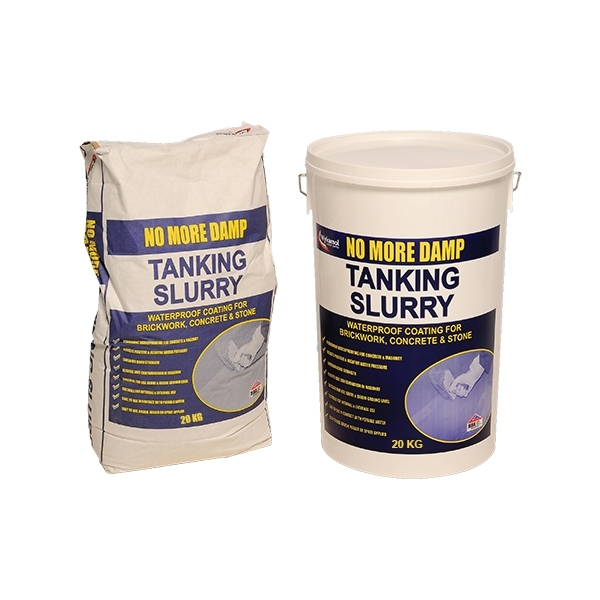 No More Damp tanking slurry waterproofs against positive and negative hydrostatic heads of water, ideal for basements and damp-proofing applications. Permanant waterproofing for concrete and masonry. Resists salt contamination in masonry. Suitable for use above and below ground.